Wild bison will be allowed to migrate out of Yellowstone National Park and stay in parts of Montana year-round under a move by Gov. Steve Bullock. The decision won’t end the slaughter of some bison that roam outside of the park, yet pushes against the collusion between cattle ranching interests and wildlife managers using the threat of brucellosis to justify private property and development rights over the spirit of the wild. 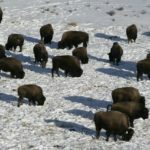 Recently Yellowstone National Park announced the intentions of culling (read kill) as many as a thousand of the park’s genetically unique and only continuously wild herd of bison. The annual slaughter has no basis in science, and is ethically bankrupt and corrupted management precipitated by ranching interests. However, read about Governor Steve Bullock’s latest decision to allow some wild bison to roam free outside the park. The slaying of bison is an annual event. Since 1985 some 8634 Yellowstone bison have been sacrificed to the livestock industry. The main justification given for this carnage is the fear of brucellosis transmission to domestic livestock. The Montana Dept. of Livestock and the USDA’s Animal and Plant Health Inspection Service (APHIS) have worked together to perpetrate the idea that brucellosis poses a threat to the livestock industry. As a consequence the state and federal agencies, including the National Park Service, more or less restrict bison to Yellowstone Park (although there is a small area where bison are permitted outside of the park for a short period of time—but they are then killed by Native Americans and Montana hunters). Excerpt from Facing the Storm, Story of the American Bison, Co-Production with The Independent Television Service (ITVS) & Montana Public Television. Unfortunately for the bison, the urge to migrate in winter to find accessible food under shallow snow cover puts them in the cross hairs of the Montana livestock industry. A “bison wall” (analogous to the Berlin Wall) effectively confines them to Yellowstone National Park. Also keep in mind that other animals also carry brucellosis. Some elk in the Greater Yellowstone Ecosystem (GYE) are also infected with brucellosis. Predators and scavengers, such as coyotes, crows, vultures, and bears, are rarely infected as well, though they are not at high risk for shedding the bacteria. The wild bison in Yellowstone are not just any old bison herd. They are the only continuously wild bison left in the United States. They are the most significant bison herd free of cattle genes. They are a national and international heritage. Most of the bison in the US are managed as commercial livestock and selection is for traits favorable to domestication. To treat Yellowstone’s bison as political prisoners to promote the power control of the livestock industry is a national disgrace. The fact that this carnage has been on-going for decades without resolution is also a scandal. The goal of eradicating brucellosis began in the 1930s. Brucellosis causes cattle to abort their first fetus and is transmissible to humans as undulant fever. Undulant fever causes flu-like symptoms in people. The brucellosis campaign was justified by health concerns and taxpayers have spent billions to eradicate the disease. However, since the major pathway for human infection was from drinking unpasteurized milk, once pasteurization became widespread, the human health threat was eliminated. Most cases today are due to people drinking unpasteurized milk and/or people who work with infected animals like veterinarians. That hasn’t stopped the livestock industry from using the public health excuse to maintain federal funding to control brucellosis, even though it is now mostly an economic issue to the industry–i.e. the livestock industry loses calves when brucellosis infected cows abort them. Today the last major reservoir of brucellosis in the United States is found in wildlife in the Greater Yellowstone Ecosystem. Wild bison were infected on or before 1917 by domestic dairy cows that were once kept in Yellowstone to provide fresh milk to tourists. Apparently, brucellosis has less serious effects on wild bison than domestic cattle because the population continues to grow in spite of infection. The risk of brucellosis transmission from bison to domestic cattle is extremely low. Testing under controlled conditions by Texas A&M researchers demonstrated that, in theory, brucellosis from bison can be transmitted to cattle (cattle were swabbed with brucellosis bacteria obtained from an infected bison). However, there has never been a documented case of brucellosis transmission from wild bison to domestic livestock. First, most wild bison pose no risk – bulls, calves, non-pregnant cows and cows with calves cannot transmit brucellosis to cattle. Only pregnant female bison can abort a fetus and this does not happen very often. If infected with brucellosis, the bison cow appears to reabsorb the fetus. This makes sense from an evolutionary perspective because the risks and costs of calving are significant, and if the bison’s body is able to confirm the calf is infected, it makes sense to terminate the birth. Second, an aborted bison calf would have to remain available for a domestic animal to find it and lick it. Given the abundance of natural scavengers including coyotes, ravens, magpies, and eagles found in the region, the chances that any infected bison fetus would remain on the ground more than a few days is extremely small. Plus the bacteria is extremely sensitive to heat, drying out and so forth, and only remains viable outside of the body for short periods of time. Third, the main time period for reabsorption and/or abortion of the fetus is in late winter (Feb-April), the chances this would occur on pastures in the Yellowstone area actively being grazed by domestic livestock is extremely small. All public grazing allotments are devoid of cattle, and even many of the private grazing lands are only stocked with cattle in the summer months. Since the main way a domestic animal can contract the disease is by licking a brucellosis infected aborted bison fetus, the fact that this occurs very rarely limits the opportunity for transmission. Other factors that also cut the chances of infection are vaccination/inoculation of cattle. A vaccine that protects cattle against infection exists, but it is not required in Montana except in the immediate area surrounding Yellowstone. While not considered 100% effective, the vaccine does significantly reduce the chance for brucellosis infection in domestic animals. Finally even if an infected animal shows up in a rancher’s herd, it is not a total loss. The herd is quarantined while it is tested for the disease. Animals testing positive for brucellosis are removed (sold for meat), and the remainder of the herd can be maintained. To recap the probability of transmission of brucellosis to domestic livestock is extremely low. An infected bison cow must abort her fetus, something that apparently is very rare in wild bison, the bacteria must remain alive and the aborted fetus has to be missed by scavengers anxious to consume an easy meal. The aborted bison fetus has to occur where there is active grazing by domestic livestock—something rare in the colder regions where bison graze in winter months. Finally a domestic animal has to find the infected fetus, lick it, consume an infective dose and be a domestic animal that was not effectively vaccinated. As any statistical analysis would tell you, the chance of all these variables being met are almost zero. The threat of bison transmission to cattle is just a ruse to justify control of wild bison by the livestock industry who fear competition for forage from wild bison on public and private lands. However, the only reason the herd is “too large” is that it’s bottled up in the park. The majority of wildlife winter range is located outside of the park borders, but unavailable to the bison because of the senseless demands of the livestock industry. If the vast amount of public land (and bison friendly private lands) outside of the park were available to bison, there would be no need for “culling” by any government agency. Currently some bison that attempt to migrate from the park are killed by Indians and/or Montana licensed hunters in small confined zones close to the Park. All of this killing provides cover to the livestock industry. In addition, bison captured and slaughtered by the Department of Livestock or the National Park Service are given to tribes which also provides an easy way to put a happy face on what is in effect a totally unnecessary slaughter of unique and rare animals. In effect, tribal members and Montana hunters are doing the dirty work for the livestock industry. At present there are almost no cattle that winter in the regions north and west of Yellowstone where bison migrate during harsh winters seeking food. Most of the public lands grazing allotments near West Yellowstone, as well as north of Gardiner, have been closed. Furthermore, many of the private land owners in both places actually support having wild bison on their properties. In recent years seasonal “bison tolerance zones” have been established in the Gardiner Basin/Eagle Creek areas adjacent to Gardiner, and in the West Yellowstone area. However, there is absolutely no reason we need “tolerance” zones in the first place. Bison should be permitted to roam on public lands year round just like all other wildlife. There is no legitimate justification for the selective killing of bison. The brucellosis threat is nothing more than a subterfuge designed to garner control over our wildlife by livestock interests. Keep in mind that we do not automatically shoot wolves that leave Yellowstone. We do not automatically shoot grizzlies that leave Yellowstone. We don’t automatically shoot pronghorn, mule deer, or elk that leave Yellowstone. Elk are among the major vectors for brucellosis transmission. Indeed, all 20 reported cases of brucellosis in GYE cattle were the result of elk transmission. In particular, elk concentrated on feed grounds as occurs in Wyoming are at a higher risk of contracting the disease from other infected elk. Estimates suggest that 35% of the elk on Wyoming feedgrounds are infected. Thus one solution is to phase out and eventually close the feedgrounds in Wyoming to prevent disease transmission of brucellosis, as well as other threats to wildlife and livestock like Chronic Wasting Disease (better known as Mad Cow Disease), and give less reasons to the livestock industry to continue its brucellosis deception. In addition to the above, the biggest factor that could change the game is if bison were listed under the ESA. If they were given the protection they deserve, the DOL would not be able to be so cavalier about killing these animals, and indeed, it would force the federal agencies like the Forest Service to work towards restoration of bison on federal lands. (Send donations to the Buffalo Field Campaign and Western Watersheds to help in this effort). Currently all of Montana’s nearby state wildlife management areas including Dome Mountain, Gallatin, Bear Creek and Wall Creek are unavailable to bison. Also most of the Custer-Gallatin NF and all of the B-DNF and the Caribou-Targhee NF are off limits to bison. This needs to be changed. There is no justification for prohibiting wild bison from occupying public lands surrounding Yellowstone. In addition to opening up adjacent federal lands on the Custer-Gallatin, Bridger-Teton and Caribou-Targhee National Forests, and nearby state wildlife lands like Dome Mountain Wildlife Management Area, listing under the ESA could speed reintroduction to other suitable federal lands like the Red Rock Lakes National Wildlife Refuge and Charles M. Russell Wildlife Refuge in Montana, on Bureau of Land Management lands in Wyoming’s Red Desert, and Idaho’s Craters of the Moon National Monument. There are National Park Service employees who are strongly opposed to the annual capture and carnage of wild bison. Secretary of Interior Jewell could direct Yellowstone National Park to drop its cooperation in the bison slaughter and conserve bison under its natural regulation policy like it does for all other wildlife species. While this might not end the butchery occurring beyond the park borders, at the very least it would make the public aware of who is behind this slaughter—namely the livestock industry. At present, due to the participation of the Park Service, tribes, and even Montana hunters, the livestock industry is getting a pass in the public relations department. Most people assume that if the NPS is participating, than killing bison must be OK.
Keep in mind that livestock production harms many other species besides bison. Everything from the killing of wolves/grizzlies to the destruction of sage grouse habitat to the dewatering of rivers critical to trout and even global climate change is a consequence of trying to raise beef for human consumption. One of the easiest ways you can undermine the ranching industry is to eat less beef, and gets friends and neighbors to understand when they consume a hamburger, they are helping to kill wild bison, wolves, and other wildlife. George Wuerthner is an ecologist and former hunting guide with a degree in wildlife biology. He has published 36 books including Wildfire: A Century of Failed Forest Policy.